What is “The Inca Trail” and why is it so popular to hike this trail? At the peak of their existence (1430 AD – 1530 AD), the Quechua civilization were called Inkas, in honor of their Royalty. According to their belief they were the sons of the sun and the Inka was their king. Under the rule of the famous Inka Pachacuti or Pachacútec, the Inka/ Inca Civilization quickly started to expand and conquer other civilizations. They called their new empire “Tawantinsuyu”, after the four different points of the compass. The Tawantinsuyu Empire covered a huge part west of the Andean Mountain Range, roughly in what are now called Peru, Ecuador, Bolivia and Chile. To facilitate transport, control and administration within their empire, the Inca Civilization constructed thousands of miles of trails! Various Spanish chroniclers and even the conquistador Hernando Pizarro have given testimony to the impressive quality of these trails, especially because they were built in very difficult terrain! Explorer Víctor Wolfgang von Hagen from the USA explored part of the Inca Trails and wrote in his book ‘Highway of the Sun: A search for the royal roads of the Incas’: “According to local legends a message sent from Cusco through a relay with specially trained runners (called Chasqui) could reach Quito in only 5 days!” To understand how impressive this is, you should know that the distance between Cusco and Quito is roughly 1980 km (1230 miles), straight through the mountains! It is even assumed that the Inca were even able to dine with fresh fish from the sea (more than 322 km (200 miles) away. To cover 1980 km in only 5 days Von Hagen thought that the Chasqui must have had some kind of ‘super powers’, or it just wasn’t possible. So he and his team put the theory to the test. They investigated all the trails they could find and discovered an extra wide trail between Jauja and Bonbon. Along this path they found remnants of what must have been little resting stations where runners could wait for their colleagues to pass on the package, or message. Von Hagen and his team proved this way that with a team of trained runners, strategically stationed along the route; it was indeed possible to cover 1980 km in 5 days! Interesting note: According to the Inca Garcilaso, the word Chasqui has three meanings: exchange, give and take, which is a very suitable name for these men since they exchanged, received and gave messages from post to post. Reading the above you now understand why there are so many different Inca Trails and that travelers who want to hike along the Inca Trail, actually have many options. But, there is only one short Inca trail left that really ends at the gate of Machu Picchu right into the famous archaeological Inca site! It is assumed that this trail originally ran all the way from Ollantaytambo to Machu Picchu, but that the Incas destroyed the first part, so the Spanish conquerors wouldn’t be able to find Machu Picchu. When Hiram Bingham and his team explored the archaeological site of Machu Picchu they re-discovered a beautiful ancient trail of about 39 to 42 km long, from Machu Picchu, through the cloud forest and over the mountains, all the way to the Urubamba River on the other side of the Andean Mountain Range. 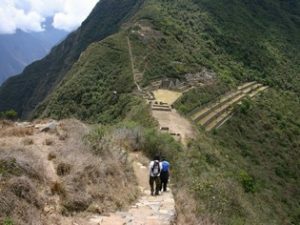 Hiking along this relatively short trail gives you already a great impression of the trail building accomplishments of the Inca civilization! More than 500 years later and with hundreds of people using the trail daily, it is still accessible! However, in an effort to protect the trail also for future generations the management of Machu Picchu now only allows 500 people a day to use this trail. Those 500 include also the porters, guides, cooks, etc., so usually there are daily about 250 tourists on this trail. Daily, except during the raining season in February. 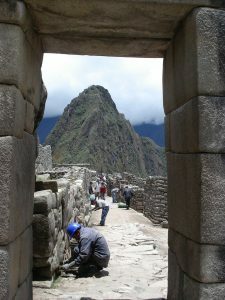 The whole month of February the Inca Trail is closed for cleaning and preservation. What most people don’t know is that this Classic Inca Trail has 2 official starting points. One starting point is at the village of Piscacucho (Km 82 along the railway from Cusco), which you can still reach by private car/ bus and the other starting point is at Km 88, which you can only reach by train. 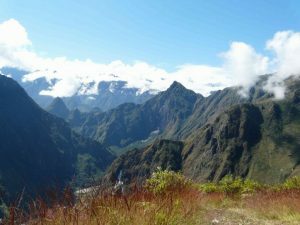 Depending on the different licenses from the agencies, the Classic 4-day Inca Trail can start at either one of these points. In memory of the Chasqui in and to gain more awareness for the impressive accomplishments of the porters along the Inca Trail, several organizations worked together to organize a special porter race called: Maratón Camino Inka. This race starts at km 88 at an altitude of 2500 m, crosses all the way over 4200 m altitude and after conquering hundreds of unequal steps it finally ends at Machu Picchu. The fastest time ever that a porter has run the Inca Trail from km 88 to Machu Picchu, is no more than 3h34 min. This was done by the Peruvian Roman Tinta in 1997. Supposedly there is already a faster time of 3h23 min, but I haven’t found re-confirmation. To offer something new the Andes Adventure travel agency started in 1996 with the yearly organization of a short marathon over the Classic Inca Trail. To raise the challenge and be able to put the Inca Trail on a Bucket List for marathon runners they later extended the running distance to exact 26.2 miles (42.16 km). More about the experiences of a running couple during their marathon. If you think that the accomplishments above are impressive, wait until you read about the blind, yes, blind trail runner Dan Berlin, who accomplished the whole 42 km of Inca Trail in 2015 in only 13 hours! Although the challenges to run the Inca Trail as fast as possible are very impressive, many argue that it’s a shame to run over this trail, since the scenery is so beautiful. For most of us, who don’t run daily through the mountains, it is better to enjoy the full 4 days of this popular trekking to Machu Picchu. Nowadays most travel agencies do everything to make walking the Inca Trail as comfortable and accessible as possible. During this 4 day trek your guide will explain everything about Inca history, the different archaeological sites along the way and the impressive flora and fauna within the Machu Picchu nature Reserve. Day 1: Start at Km82, or Km88 at an altitude of about 2550 m. Then walk around 12 km, passing the Llactapata Archaeological site, until you reach the campsite of Wayllabamba at 3000 m altitude. Day 2: Today you will hike around 9 to 13 km, depending on the assigned campsite. But all participants will have to cross today over the so called “Death Woman’s Pass”, at an altitude of 4200 m! Campsites for tonight are at Runkurakay (3800 m), just before, or just after. Day 3: Today’s hiking distance is about 11 to 15 km and mostly descending from a rough and rocky landscape into the beautiful cloud forest surrounding the Machu Picchu Sanctuary. Along the way you will be passing interesting archaeological Inca sites, including: Sayacmarca, Phuyupatarnaca and the final Wiñaywayna site (2660 m). Next to these final Inca ruins is the final campsite for the Inca Trail. Day 4: On the last day you will have to get up very early, so the porters can clean up the campsite and take all the equipment down to the train tracks before their local train departs very early from Km104. Hikers will get a breakfast package and have to wait until 5:30 am until the gate to the last part of the Inca Trail opens. It is about 4.5 km relative flat to the Inti Punku (Sun Gate) and 1.5 km downhill to Machu Picchu (2440 m altitude). After a guided tour of 3 hours around Machu Picchu you will take the train back from Aguas Calientes to Ollantaytambo and bus back to Cusco. Until a few years ago it was still possible to book a so called “2-days Inca Trail”, during which you would climb on day1 from Km104 to Wiñaywayna, stay the night at this campsite and hike the next day together with the 4-days hikers to Machu Picchu. Now the ‘2-day hike’ goes on the first day all the way from Km104, past Wiñaywayna to Machu Picchu and down to Aguas Calientes. Day 2 is only a 3 hour visit of the archaeological site. If you want to know if there are still places available on the famous 4-day Inca Trail, or to climb the Huayna Picchu Mountain, you can have a look on this official website: www.machupicchu.gob.pe –> click the link “consultas” then –> “camino inka” and select a month to see availability. For this year it is said that the DDC will likely start selling Inca Trail Permits for 2019 somewhere in October. They will start with selling the permits for January, then March, then April and so on, using the same raffle system. Important note: If you want to climb the Huayna Picchu or Machu Picchu Mountian on the archeological site of Machu Picchu, you have to let us know BEFORE the booking of your trail. Once you have booked your trail, which includes the normal entrance to Machu Picchu, it is not possible anymore to change the entrance ticket and climb one of the mountains. Because of the popularity of the Classic 4-day Inca Trail and the relative low availability, tour operators started to look for alternative treks in the surrounding. The most known ‘Alternative Inca Trails’ include: the Salkantay Trek, the Lares Trek, the Inca Jungle Trail, the Choquequirao Trek and the Ausangate Trek. From these 5 treks only the Salkantay Trek and the Inca Jungle Trail allow you to actually walk into the archaeological site of Machu Picchu. Although you won’t be walking through the Sun Gate, but through the main visitors gate from Aguas Calientes, the village below (2000 m altitude) Machu Picchu and now also called “Machu Picchu Pueblo”. After the Classic Inca Trail, the most popular trek is called the Salkantay Trek. National Geographic Adventure Travel Magazine has even listed the Salkantay Trek as one of the 25 best treks in the world. The original Salkantay Trek is around 78 km long, takes 5 days and brings you over a mountain pass at 4630 m altitude, from where you can have a splendid view of the snowcapped Salkantay Mountain (6271 m)! The trek starts at the village of Mollepata, at an altitude of 2900 m and brings you in about 12 km, through highland countryside, to the Soraypampa Campsite at 3850 m. This campsite is located close to the beautiful Humantay Lake. Today is a challanging day during which you will hike around 22 km through rough landscape, with high mountain lakes and snowcapped mountains. The trek includes a steep ascent to the highest mountain pass at an altitude of 4630 m, followed by a long gradual descent until your reach your campsite at 2750 m altitude. The hiking distance of today is around 18 km. It’s a relative easy day with a very gradual descent which brings you right into the banana plantations. Your campsite is at around 1550 m altitude in or not far from Santa Teresa village. Today or tomorrow you will also cross with the hikers of the Inca Jungle Trail, who took a different route. If you want to walk all the way (recommendable) then it is about 18 km with a gradual ascent to reach the small town of Aguas Calientes at an altitude of 2000 m. If you don’t want to hike the last 12 km along the train track from Hidroelectrica to Aguas Calientes, then you can also take the train. In Aguas Calientes you will stay in a hostel. Again, to make the Salkantay Trek more accessible and therefore easier to sell, several travel agencies now offer different trekking itineraries. One option takes only 4 days and uses (local) transport for the last part of the trail. This 4-day tour is the easiest of all 6 Inca Trails and the most diverse. It combines mountain biking and hiking and depending on the weather conditions, even rafting and zip-line activities! Two other advantages are that you don’t need much time to acclimatize before starting this trek and the price is just slightly higher that a 2 day visit to Machu Picchu. It isn’t clear why it’s called the “Jungle Trail”. It does have pretty scenery, but the only real “jungle” is along the railway from the Hidroelectrica to Aguas Calientes, from around 1600 m to 2000 m altitude. You start with mountain bikes at the 4350 m (14,271 ft) high mountain pass called Abra Málaga. In about 3 to 4 hours you will descent a winding road from the cold mountain area into the humid climate of Santa Maria at an altitude of 1430 m. Along the way you will pass the archaeological sites of Inkatambo and Huamanmarca. Today is the only full hiking day. Your hike will take you about 8 hours (depending on exact starting and finishing point) to the village of Santa Teresa, or close by. You will walk through little villages, coffee and banana plantations with views of the Andes Mountains on one side and the higher Amazon basin on the other side. Most agencies will give you the option to relax in the hot springs of Santa Teresa at the end of the day. After breakfast most agencies will give you the option to either walk across, or go by adventures Zip-Line to the other side of the Urubamba River. From the other side most agencies will transfer you by mini bus to the Hydro Electric plant at the end of the railway. 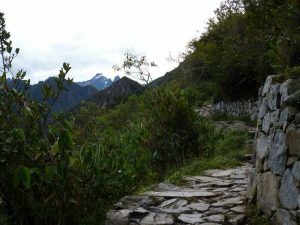 From here you will hike 12 km between the mountains and through lush forest towards the tourist town of Aguas Calientes. You will stay overnight in a hostel in town. You depart Aguas Calientes around 4:00 am to arrive early at the main gate of Machu Picchu, which opens at 6:00 am. The distance between Aguas Calientes and Machu Picchu is around 8 km, with an ascending of 400 m along a winding trail. Optional you can take the most expensive bus for 12.50 US$ one way. Tip: Many budget travel agencies choose for this last day to send you back with the last train, which departs Aguas Calientes around 21:00 h towards Ollantaytambo, arriving around 22:45 h and then by bus to the center of Cusco. With this combination you will usually don’t arrive before 1:00 am in your hostel in Cusco. The 4-day Lares Trek is actually a trek of 3 days, with various different routes. In general the Lares Trek goes through the more rural areas of the Cusco department, above the Sacred Valley. The trek is less touristy than the previous 3 hikes mentioned. All Lares trekking options end on day 3 in a little village in the Sacred Valley. However, to make the Lares Trek more popular, most travel agencies will transfer you at the end of the trek to the train station in Ollantaytambo, from where you take the train to Aguas Calientes. If your trek starts from the village of Huaran, you will hike today about 12 km with an ascending from 2900 m to the Cancha Cancha indigenous community at 3750 m altitude. Your campsite is not far from the community. The second day is usually is the toughest day, during which you hike about 10 to 14 km on high altitude, through rough mountain landscape with great scenery! Today is a relaxing day. After a few hours of walking you will visit the Indigenous Cuncani community and learn more about their culture. A little further you can also decide to soak your body in the hot springs of Lares. Then it is time for lunch, relax and saying goodbye to your porters, before you will be transferred to the train station of Ollantaytambo. You will take a late train to Aguas Calientes. Day-4 is very much the same as during the Salkantay Trek, or Inca Jungle Trail. After the popularity of the Teleferico (cable car) towards Kuelap, there are serious plans to also build a Teleferico towards the archaeological site of Choquequirao. Be fast if you still want to enjoy a more exclusive visit of the special Inca citadel. Day-1: Cusco – San Jose de Cachora – Chikiska – Playa Rosalina. In contrast with most treks, this trek starts actually with a descent from 2850 m, down into the valley of the Apurimac River towards a hamlet called Playa Rosalina at 1550 m. Some agencies continue up to Santa Rosa at 2100 m, to save hiking time the next day. After breakfast you will start ascending all the way up to a campsite (3100 m altitude) close to the archaeological Inca site of Choquequirao. Some agencies will already arrange a short visit to the site. After a guided tour over the archaeological site of Choquequirao you will start descending back the same way you came, to a campsite at 1800 m.
A moderate climb brings you back to San Jose de Cachora at 2850 m and then you drive back to Cusco. For those who have time it is also possible and recommendable, to extend the standard 4 day Choquequirao Trek up to 6 or even 9 days and make it a very adventurous, off the beaten path, but with a finish at Machu Picchu! The challenging 5-day Ausangate Trek is not about Incas and archaeological sites, but purely about enjoying the spectacular Andean mountain landscapes. During this adventures hike you will be treated with beautiful sceneries of snowcapped mountains, including the Augangate Mountain of 6384 m high, glaciers, colorful mountain lakes and the now famous Rainbow Mountains! The trek is around 70 km long during the whole trekking you will hike at an altitude between 3900 m and 5200 m! A 100 km ride brings you to the village of Tinki at an altitude of 3900 m. After lunch it is a pretty hike of 9 km, gradual ascending to our campsite at the small hot springs of Upis (4400 m altitude). Today is a moderate, but beautiful hike over the Abra Arapa Pass at 4900 m altitude, with great views over the Andean Mountain Range, passing by many lama’s, alpaca’s and vicuñas, several colorful mountain lakes and even small waterfalls! The most spectacular are the colorful Puqa Q’ocha and Japucocha lakes, which are connected by a waterfall. Campsite at 4600 m altitude. Today is one of the toughest days as you will have to summit the Abra Palomani Pass at 5200 m altitude! However, during the challenging hike you will be walking through rough, rocky landscapes with amazing mountain sceneries. Your campsite is in the green valley of Pampa Jutunpata and Rio Q’ampa valley at 4600 m altitude. During the hike of today you will have again spectacular views over the Willkanuta mountain range and will cross over the 5000 m high Abra Janca/ Q’ampa Pass. But at the end of today you can relax in the hot springs of Pacchanta village (4300 m), with view on the Ausangate Mountain! A last 11 km hike through the mountains brings you back to the settlement of Tinki. There are also extension options possible for the Ausangate Trek. Previous postThe prettiest travel route from Ecuador to Peru!